Articulate Storyline includes an option to publish your project to Microsoft Word. This can be a nice tool for situations when you want to provide learners with a printable copy of your content or if you want to give a copy of your content to a reviewer or a translator. When the Publish window appears, click the Word tab. Check the text that appears in the Title field, and customize it if you like. This text defaults to the name of your Storyline file. If you change it, it'll change the title text that Storyline places at the top of your Word document when you publish (but it won't change your actual file name). The ellipsis button (...) next to the Title field allows you to open an additional window where you can enter some optional project information if you like. However, this information is really only used if you later republish your course and some or all of your learners view it on an iPad with the Articulate Mobile Player. If that's not your situation, you don't need to worry about entering anything in these fields. For more details on how the additional project info is used, see the tutorial on Publishing a Project for Web. The Description field, you can enter some descriptive text about your course if you like. This text won't appear in your Word document, but it's used in your published output if you later republish for a different format (Web, Articulate Online, LMS, or CD). 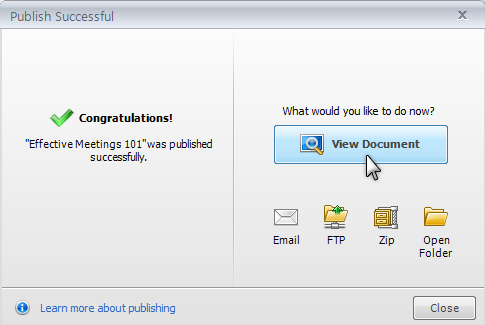 In the Folder field, indicate the place on your computer where you want Storyline to create your published output. You can click the ellipsis button (...) to browse to a specific location. 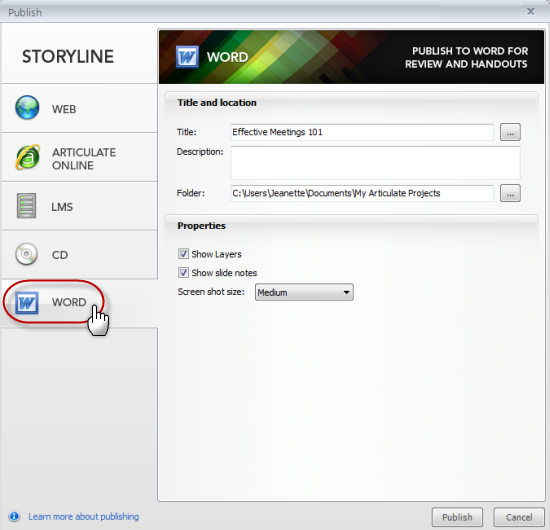 When you publish, Storyline will create a new folder in that spot, and it will contain your Word document. 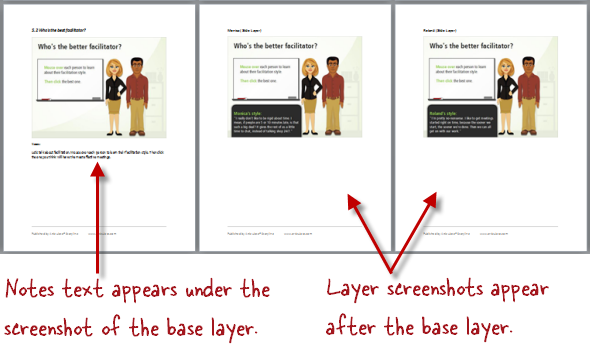 Show Layers: When you publish to Word, your Word doc will include a screenshot of each slide's base layer. If you want your document to also include a screenshot of the other layers associated with each slide, mark this box. When you publish, the layer screenshots will appear right after the associated base layer. Show slide notes: If you've entered text in the slide notes pane for any slides, you can include the notes in your Word document by marking this box. 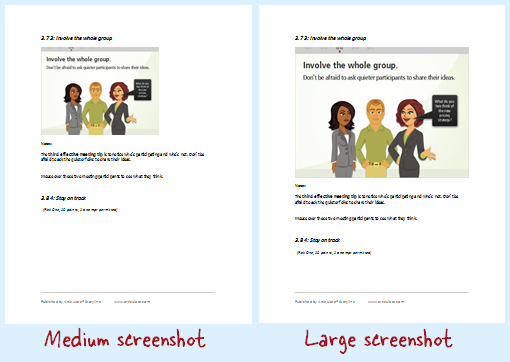 When you publish, the notes text will appear right below the screenshot of each slide's base layer. View Document: This opens your Word document in Microsoft Word so that you can take a look and make any edits you like. Email: This opens up a new email message with a zipped copy of your Word document attached. This might be helpful if you need to share your content with an SME or other reviewer, or if your course contains quiz or survey questions that you want to send to a learner who prefers to complete them with pen and paper. FTP: This pops up a window where you can enter your FTP credentials and transfer your output to your website. Open Folder: This opens a file viewer where you can see the file Storyline just created, so that you can move, rename, or copy it.